PLOT: When Tony Stark and Bruce Banner try to jump-start a dormant peacekeeping program called Ultron, things go horribly wrong and it’s up to Earth’s mightiest heroes to stop the villainous Ultron from enacting his terrible plans. 2012’s Avengers movie marked a high point for Marvel movies. A period of rebuilding had taken place following the disappointing 3rd instalment of Spiderman, an overpopulated X-Men franchise and some very poor fringe films (Ghost Rider anyone??). Marvel decided to put most of their eggs in the Avengers basket with scene setting films for Hulk, Iron Man, Thor and Captain America (poor Black Widow and Hawkeye were deemed not blockbuster material). So when they all came together for Joss Whedon’s first stab at directing the Marvel world we got a high energy, funny and engaging movie that push the limits of Marvel cheese without breaching the tipping point. 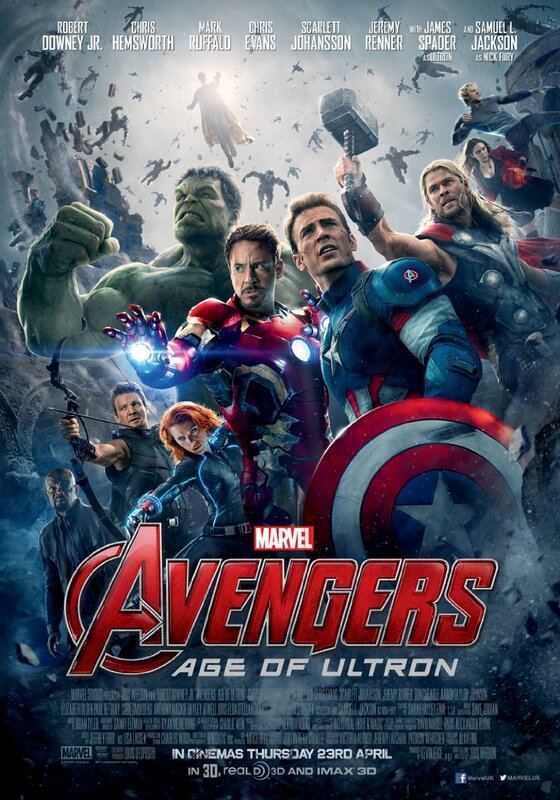 Then came Avengers: Age of Ultron, ski-jumping off the tipping point and into the abyss. Marvel have always been the fluff of the superhero world. More humour, more colour, more playing up to the kids obsessed with the WWE pantomime. But never before have they taken it to such heights. Whedon is perfect for this world having given us Buffy, Firefly and contributing on the first Toy Story. But for the most part it felt like Ultron was less of a story and more a collection of overlong, obvious fight scenes. The scenery is brought to life with incredible detail. The destruction of Sokovia is an amazing spectacle on the big screen, but this just emphasises the lack of story as you jump from fight to explosion to Iron Man gag to fight to explosion to gag about Captain America etc, etc, etc. It was good to see both Black Widow and Hawkeye elevated to equals with the other Avengers and arguably Hawkeye gets the best lines. It was also nice to see Paul Bettany come out from behind the computer screen as JARVIS becomes Vision. But nothing really happens in a film that can easily be described as ‘cleverest man in the world has dumbest idea in the world’. The next Avengers film is due to be released in two parts, hopefully this means that a much more detailed and interesting story can be created. If not then Marvel’s other band of merry superheroes may well leave Nick Fury’s troupe in their wake. With such a thin story the film becomes a simple joke-off from the main characters, in-between pretty explosions. I enjoyed it. He is a better hit man than he is a Jason Bourne. Maybe I’ll give it a shot if I see it cheap then. I watched a nice indie the other day called Chef (written, produced, and directed by Jon Favreau). Check it out, it’s on Netflix if you have that.